Arms are longer than its legs, which allows the gibbon to cover a great distance, nearly 10 feet, with each pendulum swing of its body. Skin is black and the fur around its face, hands and feet are white. They are uniformly colored, but colors may vary from cream to red, brown or almost black. Only primates that habitually walk upright on their hind legs. They walk with arms held high for balance. 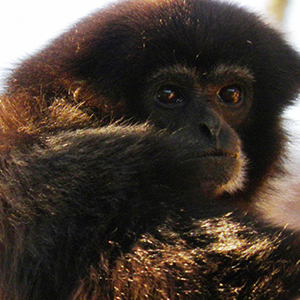 Gibbons are considered apes and not monkeys. Apes do not have tails.